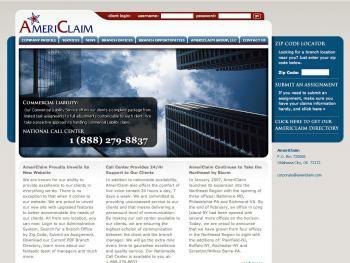 Americlaim is a claims adjusting firm. Most Insurance agencies outsource a significant portion of their adjusting to 3rd party firms. Americlaim is one of these firms. Since the vast majority of their offices are 3rd party contractors as well, their office map can change regularly. When Americlaim initially approached us, all of this content was static with an associated flash map that had to be manually altered every time an office was added or subtracted. Today Americlaim’s website is a full fledged Drupal installation including a flash map that dynamically updates based on the addition or subtraction of office nodes. Office locations are placed on the map via the zip code field in the node.